Shawn Hansen's Comedy Corner - How it all began. Beginning writing in August 2009 in the Tewksbury Advocate, Hansen wrote a variety of articles about Comedian Dave Russo. From there, he developed a column called Shawn Hansen's Comedy Corner that publishes to this day in the monthly newspaper of The Valley Patriot. Writing for the monthly based newspaper that cycles throughout 35 towns of the Merrimack Valley, Hansen interviewed Rick Cormier in the first month it published in November 2009. After his first edition was published, Hansen's column skyrocketed as he covered Comics Come Home 2009, Bill Cosby's comedy show at the Lowell Memorial Auditorium in December 2009, Jeff Dunham's Comedy Show at the Tsongas Arena in January 2010, shows with Rob Schneider, Pauly Shore, Dom Irrera, Tom Green, and Mitch Fatel at The Wilbur Theatre in Boston, April Macie's show at the East Providence Comedy Connection, ironically in April, and more. 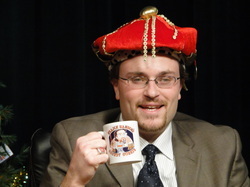 Hansen started his television show in February 2010, and has been the fastest host to produce 50, 100, 150, and 200 shows in the history of Burlington Cable Access Television, the studio he airs his show at.